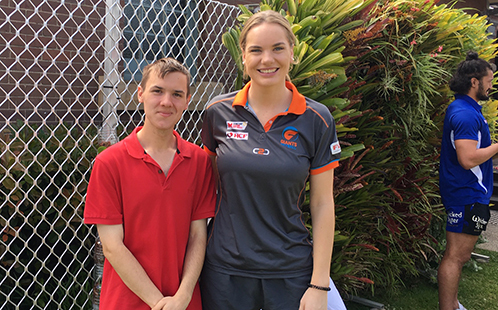 Alex Roberts met Kiera Austin from the Giants Netball team at Western Sydney University's Earth IQ Greening Day. Alex Roberts found his passion for the environment young. Aged only 11, he started collecting cans to support an orphanage in Vietnam. The project was so successful that his ‘Cans for Kids’ initiative, which involved his school, local businesses, the hospital, and Parramatta Police Station, allowed to sponsor five World Vision Children from the proceeds. In 2007 he won a Pride of Australia medal in the ‘Environment’ category for this achievement. The project also scooped a NSW government community service award and a Hill Shire Council community Project Award (Australia Day 2009). Fast forward to 2018, when Alex, now aged 23, was recognised with another well-deserved accolade, the prestigious Green Globes Award, for his work at Auburn Hospital. Now studying a Masters in Urban Management and Planning at Western Sydney University, he saw an opportunity to divert thousands of plastic bottles from landfill. Surgical utensils arrive in special plastic containers, which previously were thrown out. Alex Roberts said: “Obviously it was not environmentally friendly and it also cost the hospital thousands of dollars a month in garbage bills, so we came up with a better solution. Now we’re collecting the bottles, taking them home and giving them to organisations that can use them such as the Koala Park and schools. Since Alex’s project started, the company that manufactures the plastic containers for the utensils agreed to take them back, and recycle the material. He has also looked at other opportunities to make more sustainable choices, such as donating medical equipment rather than disposing of it. For example, Auburn Hospital gave an old incubator to the Featherdale Wildlife Park where it supports their work with injured and native wildlife.